Imagine sitting on your balcony, overlooking the well-manicured grounds at Berrington. The sun’s warm rays stream down on you and your family as you chat about your day. The fresh air smells wonderfully refreshing as birds chirp in the garden and insects buzz. You can hear the breeze peacefully drifting through the trees, and the scent of gorgeously fragrant flowers floats towards you. Your balcony area is just one of many spaces available to our residents for their clubs, activities, meetings or to welcome their friends and family, who can stop by anytime, day or night. In addition to looking over our gardens, you can set about on one of our wandering paths or take a seat in our gazebo. If you’d like to meet inside, there are two main hubs that our residents love to make use of. The first is the café, which you’ll see the moment you enter our foyer. Complimentary tea, coffee, hot chocolate and snacks are available 24/7, allowing you to be able to get a refreshment anytime you wish. Wait staff serves your every need while in the café. Another popular meeting place is our dining area. We encourage our residents to invite family and friends to join them for breakfast, lunch, dinner or every meal, if they wish. You’ll sit down and be served restaurant-style with a choice of three chef prepared courses. Just off the dining room, we offer a lounge that lends itself a more intimate atmosphere. You can sit and talk quietly there, served coffee or tea. There are more lounge areas throughout the building so that you can choose a more public space or something more peaceful, depending on your preference. For bigger gatherings, you are welcome to use the clubroom or the Berrington Room. The clubroom is where happy hour is held each Friday, which you can invite your friends or family to. It suits up to 30 people and can be reserved for a gathering of your choice without charge. The Berrington Room is slightly smaller, accommodating up to 15 people. We’ve had birthday and anniversary parties there, and one resident has even thrown a “Moving In” party there to celebrate joining the Berrington family! Catering is available through our facility, or you can bring in an outside company to do so if you wish. Our wait staff can be there to serve you no matter what your choice may be, and we’ll do everything we can to assist your event in running beautifully. We’d be happy to address any questions you have—simply contact us at Berrington on 1800 237 746. Naturally, you can have visitors in your private quarters at any time. Each room has a separate sitting area with comfortable tables and chairs. Your kitchenette allows you to make coffee or tea, so you can welcome your family and friends, serving beverages and biscuits or cakes. When you lived in your own home, you could have people over whenever you would like. At Berrington, we believe you deserve the same freedoms you’ve always enjoyed and strive to ensure you live just as you want to. 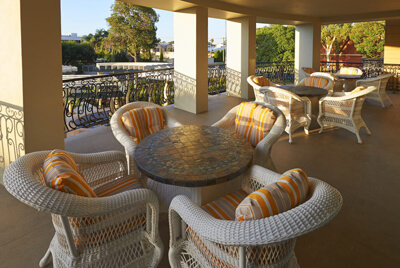 Discover more about what makes Berrington Perth’s premiere aged care residence. We can’t wait to meet with you and learn more about how we can assist you on your journey.